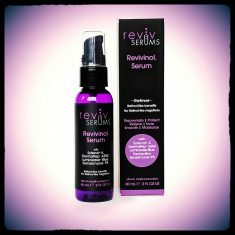 RevivSerums.com, a San Francisco-based global leader in cosmetic chemistry innovation, introduces a first-of-its-kind topical product, Revivinol “Unretinol” Serum. This potent breakthrough serum features Revivinol, a combination of two patented compounds making it the first natural true alternative to age-fighting retinol, without having any of the negative side effects like irritation or sensitivity associated with retinol. Retinol is renowned for its all-around anti-aging and acne-fighting abilities. But many people find retinol’s side effects (irritation, dryness, peeling, erythema, burning) to be unacceptable, and these side effects often result in non-compliance and discontinuation of therapy. That’s where Revivinol comes to the rescue. Revivinol’s dual action components, Sytenol (R) A and Dermapep (tm) A350, are powerful substitutes for retinol and retinoic acid without the negative side effects, and are supported by strong efficacy data shown to help reverse the appearance of wrinkles, mottled hyperpigmentation, and age-related changes. Its retinol-like activity helps support skin’s natural collagen synthesis and an anti-aging effect against environmental stimulus like UV irradiation. Great for all skin types, even sensitive, it does not irritate or make skin photosensitive like retinoids, so it may be used during the day. Revivinol Serum also targets damaging UV, infra-red, and blue light radiations from phones, tablets and computers, as well as pollutants in the air, with the remarkable compound LUMICEASE BLUE. Revivinol “Unretinol” Serum is available immediately at RevivSerums.com here, which ships to many countries worldwide with free shipping, and at select retailers, e-tailers, salons, medspas and physician’s offices. Its release coincides with Indie Beauty Expo Los Angeles, the biggest independent beauty trade event in the world. Revivinol is a trademark of Astonishing Developments Ltd. Sytenol is a registered trademark of Sytheon Ltd. DermaPep is a trademark of Miwon Commercial Co., Ltd. LUMICEASE is a trademark of Lipotec S.A. Other company and/or product names may be trade names, trademarks and/or registered trademarks of the respective owners with which they are associated. These statements have not been evaluated by the U.S. Food and Drug Administration. Products not intended to diagnose, treat, cure, or prevent any disease. Products described are intended to meet the FDA’s definition of a cosmetic product, an article applied to the human body to cleanse, beautify, promote attractiveness, and alter appearances. About RevivSerums.com / Astonishing Developments Ltd.
RevivSerums.com, based in beautiful San Francisco, specializes in novel and innovative clinical treatment serums for skin and hair rejuvenation. Their unique formulations are next-generation, high-performance, leading-edge — and any other great hyphenated catchphrases you can imagine. All about eyebags, dark circles, eye puffiness — and a Reviv Serums solution! In pursuit of perfect skin, we try countless serums and creams, book elaborate facials, and chug water religiously, yet there’s a beyond-simple fix that has been staring us in the face all this time: giving up (or significantly cutting back on) alcohol—which we’ve long known is no health elixir, but has a perhaps unexpected impact on our complexions, in particular. “Alcohol is actually one of the worst, most aggressive compounds to destroy your skin,” says New York nutritionist Jairo Rodriguez, who counts designers and Vogue editors among his clients. “I always joke with my patients, ‘If you want to get older, go ahead and drink!’ ” Here, Rodriguez breaks down the exact effects alcohol can have on your skin and how, when you do indulge, to imbibe in the best possible way. Dehydration Is the Issue . . .
We use a novel form of Vitamin C in our Ultimate Serum: BV-OSC or Tetrahexyldecyl Ascorbate. This oil-soluble version of vitamin C is very bio-available and has excellent percutaneous absorption into the skin compared to ascorbic acid. It is able to penetrate keratinocytes to assist with the prevention of UV damage and provide a cytoprotection effect against cell mortality. Studies show its anti-aging properties, including collagen synthesis. The use of BV-OSC has shown to DOUBLE collagen synthesis in fibroblasts. It has also been shown to reduce melanogenesis by more than 80%, and inhibit tyrosinase activity, making it an excellent ingredient for brightening and evening out skin tone. While BV-OSC is decidedly more expensive than other forms of Vitamin C, its benefits clearly outweigh its hefty price. Details, data and graphs here. Get these remarkable properties in our Ultimate Serum for face, neck, chest and hands (product page here).